About three weeks ago I mindlessly decided to book a solo trip to Austin and it ended up becoming one of my favorite decisions this year. I would be lying if I didn't say that I was a little nervous going by myself but those feelings quickly disintegrated when I felt the warmth from every single stranger I came across. If you know me at all you know I'm deeply introverted but this place brought out a different side of me. I'd be hard-pressed to not want to socialize when this city and it's people are so damn charming! The live music, the delicious food, the overwhelming cocktail scene, the mural-embellished buildings- I wasn't expecting to love it as much as I did. 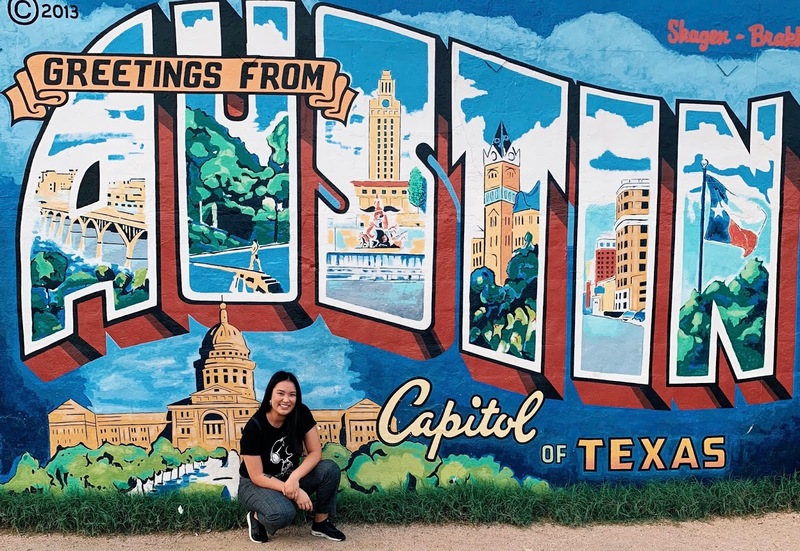 I flew in Saturday evening and headed straight to South Congress to try Torchy's Tacos and browse the cute lil shops. Crossed the Congress Bridge to check out Rainey Street, a line of houses transformed into bars- it felt like a block party! I was in awe. I ended up checking out Lustre Pearl and Half Step, both of which had really good cocktails. The second day I had been debating whether or not I was going to hit up Austin City Limits but decided by noon to buy a cheap ticket from a scalper. I got to see Twin Shadow, Moses Sumney, Janelle Monae, Vince Staples, Shawn Mendes, Arctic Monkeys, and Travis Scott... it was an eclectic day to say the least but so is my taste in music so it worked out haha. Monday morning I got brunch at Stella San Jac- a modernized southern food joint at the Westin Hotel, explored the Texas Capitol building, marveled at the street art at the HOPE Outdoor Gallery, browsed the records at Waterloo Records, spent hours reading and waiting out the rain at an independent bookstore called BookPeople, got dinner at this Texas BBQ meets Japanese izakaya restaurant called Kemuri Tatsu-Ya (they put brisket in their ramen! ), and watched this vibrant soul singer, Brian Scartocci, at this random hole in the wall bar called The Skylark Lounge. It was a Monday night but he was going off like he was playing a sold out Staples show- after that night I understood why Austin is known as the "Live Music Capital of the World". The next day I took a last min day trip out to Houston and got chicken n' waffles at Beyonce's fave breakfast spot in downtown called The Breakfast Klub which was an experience! So much warmth and soul radiating from that place. But the whole reason I drove three hours to Houston was actually to nerd tf out and live my childhood dream at NASA. The way I got emotional seeing the Starry Night at the MOMA in NY was exactly the kind of emotional I got pulling up to the Space Center. I was never prepared to be an adult at 25-years-old still fulfilling childhood fantasies haha but man it was everything I hoped for. That same day I got back to Austin and decided to hit up a few cocktail bars- Garage, a speakeasy literally inside a parking garage, and The Roosevelt Room. The cocktail scene in Austin is amazing. I'd like to come back one day solely to try all the ones I didn't get around to. My final day in Austin was spent doing all the things I didn't have time to do all the other days. Braved the line at Franklin Barbecue and I will say it was well WORTH IT. The entire time I felt like I was having a revelation haha like how is this brisket seriously melting in my mouth?! I remember watching Anthony Bourdain's No Reservations Austin episode and seeing him take a bite of the brisket and going, "Get your dumbass to Austin!" I get it now and my life is forever changed because of it. After that amazing meal, I drove out to the 360 Overlook of the Pennybacker Bridge, hiked down to the Hamilton Pool Preserve which was so beautiful, got ice cream at Lick Honest Ice Cream, and explored a little more of SOCO before heading to the airport. In a lot of ways, this trip made me feel like the naive "kidult" I was in college haha. Maybe it had to do with the fact that I hadn't felt short or like a minority since attending SDSU or that seeing Arctic Monkeys live again brought me back to when I was an angsty 19-year-old interning for the radio station but if I'm being honest, I think it mainly had to do with the fact that I was completely and comfortably on my own. This solo trip reminded me of how I used to be so comfortable in my own company but, of course, that was before I knew anything existed beyond that. Being ignorantly blissful and never experiencing heartbreak will do that to ya. But now being 25 and having gained a little bit more life experience, I didn't realize how much I had strayed from that genuinely content solitude I used to embody. Thankfully, I feel like this trip brought me back that sense of empowerment in my aloneness. I wasn't expecting some sort of soul searching revelation on this trip but who am I kidding? I am an INFJ after all, everything has to be so damn sentimental haha. But to wrap it up, the southern hospitality was real and Austin was so sweet.